xLath™, shown below, is a self furring radiant ceiling heating and cooling module that is designed to efficiently heat and cool buildings. This hydronic module combines Resilient Channel (RC) sound isolation with a hydronic tube fin to accomplish ambient heating and cooling. This system radiates cool and hot temperatures from the ceiling of a building, much like the sun's heat rays radiate down to our earth's crust. New technology does not always have to cost a fortune. The Talbott Team stands by xLath™'s cost effectiveness, rapid and simple construction and installation. Furthermore, the efficiency and durability of our product will save you money in the long run, as service checks are rarely necessary. 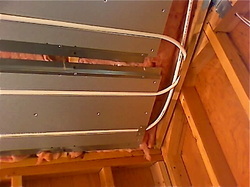 There are secondary benefits including; when the HC Panel is used on a ceiling between floors as in 2 story homes, the HC Panel provides sound isolation, and a radiant barrier foil can be placed between the joists and the HC Panel to reduce the back losses and improve panel performance. xLath™ modules are nominally 16”x24” and utilize any approved 1/2” (5/8” OD) SDR9 flexible tubing. What is in an invention? Made from sheet metal glazed with a high-emissivity coating to ensure heat transfer, these ready-to-use radiant panels are attached to ceiling joists and covered with drywall. The close contact between the drywall and radiant panels encourages thermal exchange through the ceiling. When xLath™ module installations are completed, the tubing is installed, connected to manifolds, and pressure tested for building inspection. The hydronics equipment selection follows the system's straightforward plan. In fact, the decision of whether to use chillers, boilers, or heat pumps depends on a client's personal preference. Furthermore, it can also depend on building location, the type of energy that is available, and the client's long term goals regarding his/her system. To say the least, there are numerous solutions available that can be used with our xLath™ radiant panel system. We look forward to tailoring our installations to your household/business' needs.